Apple is expected to grow iMac sales to one million units during the upcoming quarter on the back of new, more powerful models with enhanced display technology, according to well-connected KGI analyst Ming-Chi Kuo. In a note to investors obtained by AppleInsider on Sunday, Kuo said he expects iMac sales to grow 100 percent quarter-over-quarter, ending the upcoming September period with one million units shipped. Spurring sales will be new models featuring faster processors and "much better" display quality, Kuo said. Last October Apple introduced one of the highest-resolution screens available in an all-in-one machine with its 5K iMac. This year, Kuo predicts a focus on image quality, specifically color saturation enhancements with a new LED phosphor material called KSF. Kuo gave no indication that rumors regarding an 8K iMac were valid. 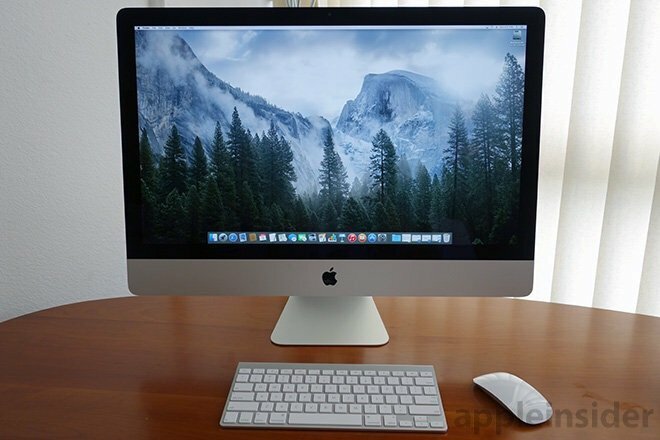 In a press release in April, Apple display supplier LG suggested a super high-resolution iMac would debut later in 2015, though Apple has yet to announce any such device. Accounting for at least part of iMac's sequential sales growth is a lower than normal base established over the trailing quarter, which Kuo attributes to inventory corrections on Apple's part. Also playing a factor will be upcoming promotional pricing and standard price reductions that sometimes come alongside product refreshes. According to market research firm IDC, Apple was the only computer manufacturer to see positive growth in quarter two, yet again bucking a declining worldwide PC market. Apple revealed during a recent quarterly results conference call for investors that Mac sales jumped 9 percent year-over-year. If Apple sticks to its anual product cycle, new iMacs could reach store shelves in time for the holidays.